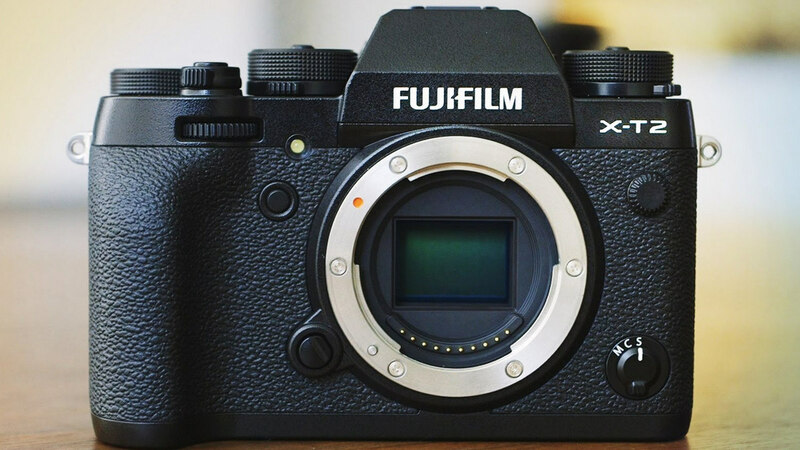 With the announcement of the Fuji X-T2 things have got interesting again in the Fujifilm world. Why? Because of the little joystick at the back of the camera. Simple as that. I have the same thing on the back of the Sony A900 camera and it's something I appreciate very much, and something I use quite a bit. Only with the Fuji it's become more accurate as you have a lot more focusing points to choose from. I.E. Focusing fields have become finer and more exact. I'm also finding the new 24MP sensor upgrade pretty nice too. When doing some cropping the more megapixels you have the better. I don't do a lot of cropping but I was finding myself reaching the limit at times. The 24MP sensor will give me a little more breathing space (yes, same sensor as X-Pro2 but that camera hasn't really interested me for smoe reason). The new lenses announced sound really nice. The 23 f2 and 50 f2 are especially enticing. I didn't buy the 23 f1.4 or the 56 f1.2. Just couldn't justify it. The 35 f2 wasn't acquired as I have the 35 f1.4. The way I see it I really don't need the fast apertures on these lenses and that's the reason I haven't purchased the 16 f1.4. If they ever make an f2.8 or f4 version I'll acquire it in the blink of an eye. A slower aperture would also make the lenses smaller and what's more important, cheaper. That's what attracts me to these lenses (and system). Let's face it Fuji make darn good lenses and I haven't really found a bad one yet. I'd love to buy the 14 f2.8 but I just can't justify that either. Maybe the 10-24 f4 would be a better deal for me. I'm mainly a landscape sort of guy and I'm looking for more DOF most of the time, not less which is another reason I'm not purchasing those fast lenses. The 80 f2.8 sounds like my cup of tea as well. It's not as bulky as the 90 f2 and it should be a lot cheaper. It's also compatible with the 1.4x and 2.0x teleconverters. Another excellent decision Fuji made was to make these lenses WR. No need to worry about a little rain anymore. Having taken a god look at the lens lineup from Fuji I can pretty much sum up what's on the shopping list at this very moment. 1. 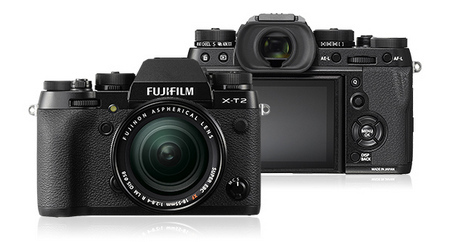 The new X-T2. I think this is a certainty. 2. I won't need anything longer than the 55-200 f3.5-4.8 which I already own. That means no 50-140 f2.8 (heavy) or the 100-400 f4.5-5.6 (large and heavy. If I was to purchase those there wouldn't have been advantage in moving to a mirrorless system. I got rid of all my large and heavy Canon L lenses some time ago. 3. The 23 f2 looks like it might be shipping any day now and that will definitely be acquired. 4. 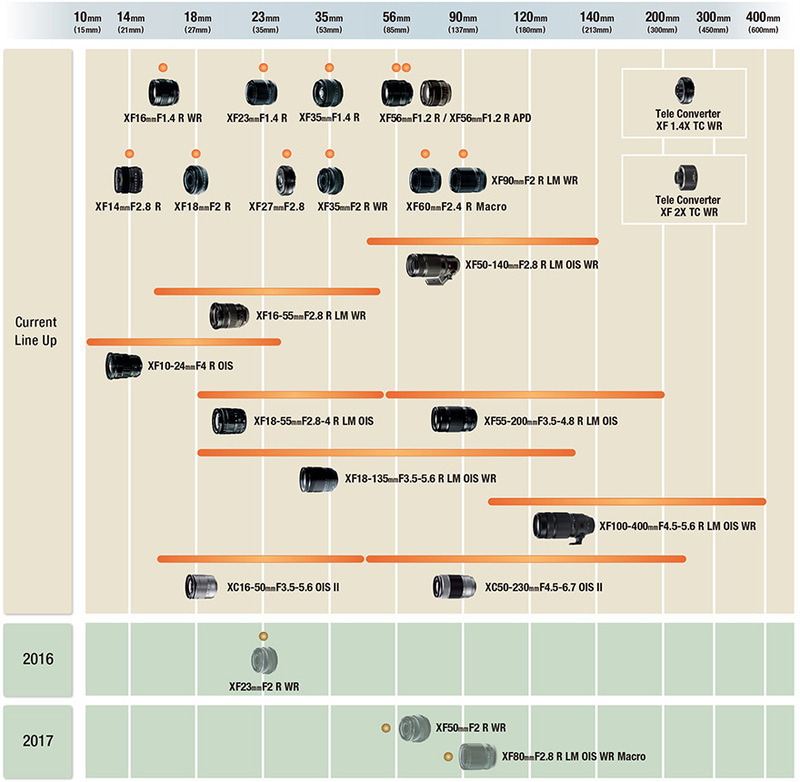 The 50 f2 and the 80 f2.8 will only be available in 2017 so that leaves some time to save. I'll probably get the 1.4x teleconverter at the same time as the 80 f2.8. Depending on image quality, if good, I'll get the 2.0x teleconverter too. 5. I already have the 18-135 f3.5-5.6 but finding it's only an OK lens so right now I'm looking at the 16-55 f2.8 lens. The fact that it doesn't have OIS shouldn't be a problem but I do find that the older I get the more I like it. That is a 24-84mm in 35mm terms so it's a nice general walkabout lens. My only real problem is at the wide end of the spectrum. My widest lens being an 18mm (27mm equiv. ), you can't call that really wide. Personally (and I have been known to be wrong in the past) I don't think Fuji will be looking at replacing the 10-24 f4 for some time and it would be a safe purchase. I don't think they'll be bringing any primes wider than the 14 f2.8 onto the market any time soon either. They have more important things to think about. So that leaves 2 options open if I want anything wider. Either get the 10-24 f4 (the cheapest I can find presently is a little over €100. Ouch!!) or go the 3rd party route. Say Samyang or similar. Somehow though, being so impressed with the image quality from the Fuji lenses I have so far purchased, that 10-24 f4 lens is looking pretty good right now.